Long-time Vintage members were crushed to hear of the passing of Elroy “Buck” Hilbert of Union, Illinois, on Wednesday, August 3. He was 91 years of age. Buck was exactly the right man, at exactly the right place, at exactly the right time. Buck served as president of Antique/Classic for six years. He then served continuously as an active member of the Vintage Board of Directors, was a longtime contributor to Vintage Airplane magazine, remembered for his monthly column, “Pass It ti Buck.” He was a VAA Director Emeritus at the time of his death. 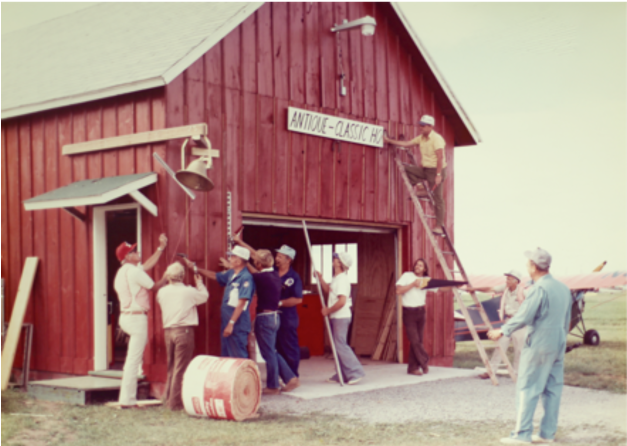 Buck was also a member of the EAA Aviation Foundation Board of Directors for 30 years, from 1972 to 2002. 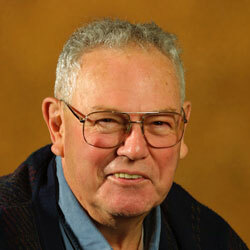 He created the Dorothy Hilbert Award, named for his late wife, to honor volunteer contributions to AirVenture. Today the Vintage Aircraft Association is the finest, largest, and most successful vintage airplane association in the world. Buck has gone west after a lifetime of being deeply immersed in aviation from his earliest days as a lineboy at the old Chicago Elmhurst Airport where he soloed an Aeronca LA Chief at 16, which was quickly followed by a thrilling solo in Jack Rose’s tiny 40-hp open cockpit Parrakeet biplane. Following his military aviation career during World War II and Korea, Buck joined United Airlines in 1952 and flew a full airline career in DC-3s, Convairs, Viscounts, DC-6s, DC-7s, 707s, 727s, and concluded his United cockpit career in DC-8s; he retired from United in 1989. 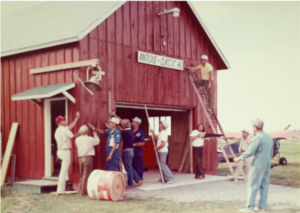 Buck Hilbert (blue jumpsuit, right) directs the first of many volunteer restorations and expansions of our Red Barn HQ in 1974. Vintage Airplane will cover Buck’s life in more depth in the November/December 2016 issue as we were unable to do so prior to the Vintage Airplane September/October publication deadline. EAA and Vintage extend heartfelt condolences to the Hilbert family and to Buck’s countless aviation friends and associates. If you have a memory of Buck you’d like to share with us, please send a note to editorial@eaa.org. A memorial service for Buck will take place Saturday, October 1, 2016, at 1 p.m., at the Poplar Grove Vintage Wings and Wheels Museum (C77), with light refreshments served afterwards concluding with a sunset tribute flight. The address for the museum is 5151 Orth Rd, Poplar Grove, Illinois.